When you're dealing with quadratic functions, maximum and minimum are very likely to come up. 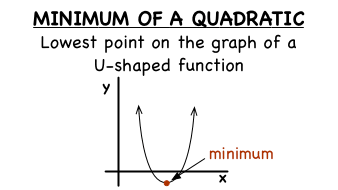 This tutorial takes a look at the minimum of a quadratic function. Check it out! When you're dealing with quadratic functions, maximum and minimum are very likely to come up. This tutorial takes a look at the maximum of a quadratic function. Check it out!